Click to read the full report in PDF version . The Popular Front for the Liberation of Palestine (PFLP) is a terrorist organization designated as such by the US, EU, Canada, and Israel. The PFLP is involved in suicide bombings, hijackings, and assassinations, among other terrorist activities targeting civilians. Many European countries fund a network of organizations, some of which are directly affiliated with the PFLP, and others with a substantial presence of employees and officials linked to the PFLP. The non-governmental organizations (NGOs) include Addameer, Al-Haq, Alternative Information Center (AIC), Defense for Children International – Palestine (DCI-P), Health Work Committee (HWC), Stop the Wall, Palestinian Center for Human Rights (PCHR), and the Union of Agricultural Work Committees (UAWC). The NGO ties to the PFLP range from establishment and operation of NGOs by the PFLP itself to NGO officials and staffers being convicted of terrorism charges by Israeli courts. Some of these individuals have been denied entry and exit visas by Israeli (and Jordanian) authorities due to security concerns. A significant number of these NGO officials hold multiple positions in various organizations, indicating the close connections and relationships between these groups. Donors to the NGOs include the EU, the governments of Sweden, Denmark, Spain, Norway, Ireland, UK, the Netherlands, Germany, Belgium, France, and Switzerland, and the United Nations. Continued funding raises serious questions about due diligence and evaluation on the part of the governments and the UN, as well as compliance with domestic and international laws. One such example is the NGO Addameer, which is funded by Denmark, the Netherlands, Norway, Sweden, Switzerland, and others. Addameer campaigns in support of Palestinians convicted of security offenses. This agenda should have demanded close scrutiny and due diligence before any grants were provided. The clear affiliation between these NGOs and the PFLP requires immediate attention and concrete measures on the part of European funders, ensuring that funds do not go to groups affiliated with the PFLP or other terrorist entities. All ongoing funding should be frozen until funders undertake independent reviews of the processes that allowed funding for these NGOs. Reviews must be conducted in conjunction with national and international policing and security services as well as with Israeli counterparts. Israeli elected and public officials should take up the issue of the PFLP-NGO network with their European colleagues to discuss guidelines and ensure that funding does not reach terror-affiliated groups. The abuse of human rights organizations in conflict zones is a constant global concern. NGOs face significant challenges in achieving their humanitarian goals in areas controlled by terror organizations. Further, such NGOs themselves face the danger of infiltration by terrorist groups seeking to exploit their resources (see the case of World Vision in Gaza below). In other instances, the terrorist groups establish new NGOs in order to gain both political legitimacy and access to public resources. However, in the Israeli-Palestinian conflict, as in other conflicts, the lines between terrorist organizations and NGOs operating in Israel, the West Bank, and Gaza have been blurred. The exploitation of NGOs by terrorist groups was highlighted in the August 2016 announcement by the Shin Bet (the Israel Security Agency) that Mohammad Halabi, manager of World Vision operations in Gaza, had funneled 60% of World Vision’s Gaza budget to the Hamas terrorist group. Several NGOs with links to terrorist groups receive major funding from European governments. In particular, activists from the Popular Front for the Liberation of Palestine (PFLP) have ties to several prominent NGOs including: Addameer, Al-Haq, Alternative Information Center (AIC), Defense for Children International – Palestine (DCI-P), Health Work Committee (HWC), Palestinian Center for Human Rights (PCHR), and the Union of Agricultural Work Committees (UAWC). There is no evidence that these links are considered in the funding processes of the donor governments. Founded by George Habash in 1967, the PFLP is a secular Palestinian Marxist-Leninist organization, originally supported by the former Soviet Union and China. PFLP members have carried out numerous terrorist acts since its founding, and the group was the first Palestinian organization to hijack airplanes in the 1960s and 1970s. Most notably, the group was responsible for the assassination of Israeli Minister of Tourism Rechavam Ze’evi in 2001, and its members joined with the Baader-Meinhof Gang (a West German radical group) to hijack an Air France Tel Aviv-bound flight in 1976, landing it in Entebbe, Uganda. The PFLP is also responsible for suicide bombings in Israel, and members of the organization took credit for the house invasion and murder of the Fogel family in 2011 and the massacre at a synagogue in Jerusalem’s Har Nof neighborhood in 2014 where five people were murdered. The PFLP is designated a terrorist organization by the US, EU, Canada, and Israel, and has reportedly received support from the Syrian and Iranian governments. As this report shows, the NGOs that have ties to the PFLP in various ways are funded by a number of European governments and international organizations. These funders include, Sweden, Denmark, Spain, Norway, EU, Ireland, UK, the Netherlands, Germany, Belgium, France, Switzerland, and the United Nations. It is unclear what, if any, due diligence was conducted by the countries and organizations regarding the PFLP links prior to funding. NGO ties to the PFLP range from establishment and operation by the PFLP itself to NGO officials and staffers being convicted of terrorism charges by Israeli courts. Some individuals have been denied entry and exit visas by Israeli (and Jordanian) authorities due to security concerns stemming from PFLP roles. A significant number of these NGO officials hold multiple positions in various organizations, indicating the close connections and relationships between these groups. 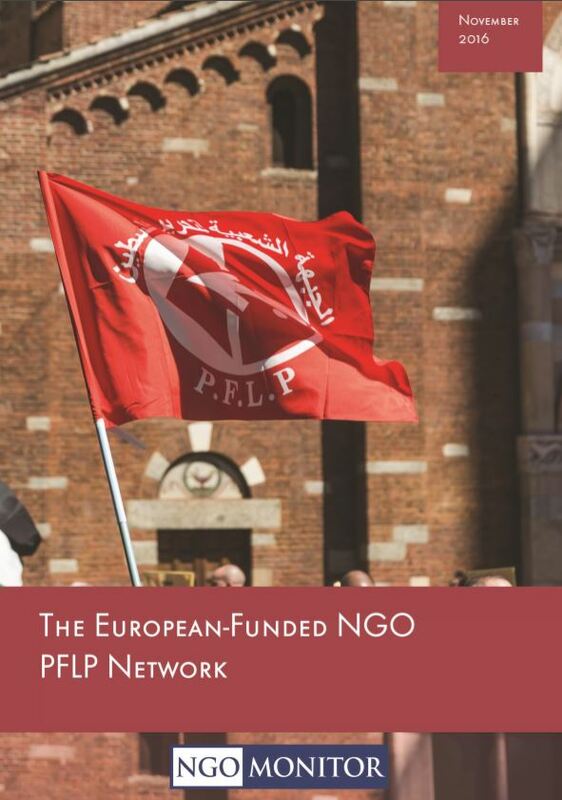 This report will demonstrate the ties between various NGO employees, the PFLP terrorist group, and European supporters, raising questions as to the conformity of this funding with legal requirements in these countries. Addameer is an official PFLP “affiliate.” The NGO’s chairperson and co-founder, Abdul-latif Ghaith, was banned by Israel from travelling internationally due to his alleged membership in the PFLP; he was also banned from entering the West Bank from 2011 to 2015. Abdul-latif Ghaith was described in an article posted by Miftah (another Palestinian NGO) as a representative of the PFLP. Khalida Jarrar, Addameer’s vice-chairperson, is a senior PFLP official. On April 1, 2015, Jarrar was placed in administrative detention by Israeli security forces. On April 15, 2015 she was indicted for various offenses including active membership in a terrorist organization (the PFLP) and inciting violence through a call to kidnap Israeli soldiers to be used as “bargaining chips for the release of Palestinian prisoners.” Jarrar accepted a plea bargain and, according to reports, was convicted on “one count of belonging to an illegal organization and another of incitement.” She received a 15-month prison sentence with an additional 10-month suspended sentence. Jarrar was released from prison on June 3, 2016. Addameer board member Yousef Habash is apparently the nephew of PFLP founder George Habash. Israel prevented Yousef Habash from leaving the West Bank from 2011 to 2012. He is also a member of the BDS National Committee. Ayman Nasser, an Addameer researcher, was arrested on October 15, 2012 for alleged links to the PFLP. An indictment was filed attributing a number of offenses relating to membership in the PFLP and activities on behalf of the organization. On June 3, 2013 the Judea Military Court convicted Nasser, who admitted to being a member of the terrorist organization and for providing services to the organization. On February 23, Anas Barghouthi, a lawyer for Addameer, pleaded guilty to membership in the PFLP. Sumoud Saadat, Addameer’s documentation officer, is the daughter of PFLP general secretary Ahmad Saadat – who is serving a 30 year prison sentence in Israel due to his terrorist activity. Suha Al Bargouti, Addameer’s treasurer, is the wife of alleged PFLP member Ahmed Qatamesh. Al-Haq describes itself as a prominent Palestinian human rights organization. The evidence shows that the NGO is a leader of anti-Israel “lawfare” campaigns (the abuse of courts for political ends), including several cases in the UK, Canada, and other countries. Al-Haq also lobbies the International Criminal Court (ICC) for the prosecution of Israelis and is a leader of BDS (boycott, divestment, and sanction) campaigns. Al-Haq is a member of the Euro-Mediterranean Human Rights Network (EMHRN), the World Organisation Against Torture (OMCT), the International Federation for Human Rights (FIDH), Habitat International Coalition (HIC), and the Palestinian NGO Network (PNGO). Al Haq’s General Director, Shawan Jabarin, has alleged ties to the PFLP terrorist organization and, as such, has been denied exit visas by Israel and Jordan. In addition to his role at Al-Haq, Shawan Jabarin is a Secretary General of the International Federation for Human Rights (FIDH) and is on the Middle East Advisory Board of Human Rights Watch (HRW). Health Work Committee and Union of Health Work Committees are Palestinian health organizations that are active in Jerusalem and the West Bank, and Gaza, respectively, that have each have a history of anti-Israel activities. HWC’s NGO and government partners include Diakonia, Medical Aid for Palestinians (MAP), the United Nations Development Program (UNDP), the Interchurch Organization for Development Cooperation (ICCO – the Netherlands), the European Union, and Oxfam. Former executive director Dr. Majed Nassar has alleged ties to the PFLP. According to a 2007 document, Israel has prevented Dr. Majed Nassar from traveling “since 2001,” a decision upheld by the HCJ. Dr. Majed Nassar is also Deputy Director of the Union of Health Work Committees (UHWC) and has been cited as a PFLP member. UHWC itself is a PFLP affiliated health committee active in Gaza, as identified by USAID and in Palestinian documents. Nassar also served as an official with Defense for Children International- Palestine (DCI-P) and is a member of the board of directors at the Alternative Information Center (AIC). From 2013 to 2014, Nassar served as Director of Programs in the West Bank for the British NGO Medical Aid for Palestinians (MAP). The late Dr. Ahmad Maslamani, co-founder of the Health Work Committees of the West Bank, was a “Central Committee member of the Popular Front for the Liberation of Palestine” (as stated by the PFLP itself). Dr. Rabah Muhanna, “member of the Political Bureau of the PFLP and leader of its branch in Gaza,” was head of the UHWC (2001) and was one of the organizations founders. Yousef Habash, discussed above (Addameer), is the public relations officer at UHWC. HWC’s Youth Development Program, “A community, cultural, and social development program that provide services to Jerusalemite youth through ‘Nidal Center’ in the old city of Jerusalem,” was closed by Israeli authorities from 2009 to 2012 due to its ties to the PFLP. The Nidal Center encompasses HWC’s Kanan project, a project dedicated to strengthening “the social and political participation channels of the Palestinian population in East Jerusalem through enhancing the capacity of the youth…” and implemented by six political NGOs, among them Defense for Children International – Palestine, Alternative Information Center (AIC), ACSUR, and Mundubat. Prior to the organization’s founding, AIC co-founder Michael Warschawski was a leader of “Matzpen,” the anti-Zionist Trotskyite organization. Warschawski was jailed in the 1990s for publishing an informational pamphlet for the PFLP terror group (verdict on file). The co-director of AIC, Nassar Ibrahim, is also the former editor of El Hadaf – the PFLP’s weekly publication. AIC Board of Directors member (2008) Rifat Odeh Kassis has links to multiple NGOs with PFLP ties and was arrested and imprisoned several times by Israel. Kassis is the founder of DCI-P (see below); the general coordinator of Kairos Palestine, a major BDS effort steeped in Christian theology; and was a member of an advisory group for DanChurchAid. Defense for the Children International – Palestine’s (DCI-P) mission is, “Promoting and protecting the rights of Palestinian children in accordance with the United Nations Convention on the Rights of the Child, as well as other international, regional, and local standards.” DCI-P is, however, involved in BDS and lawfare campaigns, and frequently publishes false and unverifiable information and accusations regarding alleged “child abuse” by Israeli security forces in its reports. Several DCI-P board members have apparent ties to the PFLP. Mahmoud Jiddah, reportedly a “PFLP member,” was imprisoned by Israel for 17 years for carrying out “grenade attacks” against Israeli civilians in Jerusalem in 1968. Hassan Abed Aljawad is similarly described as a Bethlehem-based “PFLP activist,” or “leader,” representing the PFLP at public events. Fatima Daana, an attorney and board secretary, is apparently the widow of Raed Nazzal, the former commander of the PFLP’s armed wing (the Abu Ali Mustafa Brigades) in Qalqilya. Nazzal was responsible for several terrorist attacks and was killed in 2002 in a shootout with IDF forces. Previous board members had demonstrable PFLP ties as well. From 2007 to 2014, Shawan Jabarin – an alleged PFLP activist and director of Al-Haq (see above) – was a member of DCI-P’s Board of Directors. Alleged PFLP affiliates Nassar Ibrahim and Dr. Majed Nassar (see above) were also on the Board. Hashem Abu Maria, a DCI-P employee, was hailed by the PFLP as a “comrade” and a “leader” after his death in 2014. Khawaja was arrested again on October 26, 2016 and as of November 13, 2016 is still being held. On May 8, 2012, the IDF raided Stop the Wall offices in Ramallah, and confiscated a number of computers. Raji Sourani, founder and director of the PCHR, was “prohibited from leaving Palestine (sic) from 1977 to 1990.” In an interview, Sourani admitted that he served “a three-year sentence [1979-1982] imposed by an Israeli court which convicted him of membership in the illegal Popular Front for the Liberation of Palestine…” Sourani was imprisoned an additional three times “in 1985 and 1986…” and held in administrative detention in 1988. From 1986 to 1987 he was “restricted from legal work for one year by an Israeli military decision issued by the Israeli Military Governor.” He was also denied a US entry visa and was thus unable to travel to participate in the Russell Tribunal on Palestine (RToP) in 20121. In February 2014, the PFLP organized a ceremony in Gaza honoring Sourani for winning the “Alternative Noble Prize.” Dr. Rabah Muhana (see UHWC above), a member of the PFLP Political Bureau, delivered a speech at the prize ceremony. Clearly demonstrating its terrorist ties, UAWC mentions that it organized “a solidarity day with the Secretary General of the Popular Front for the Liberation of Palestine, Ahmed Saadat…” The “solidarity day” featured Muhammad Bakri, executive director of the Union of Agricultural Work Committees in Gaza, and celebrated “the tenth anniversary of the assassination of Israeli Tourism Minister Rehavam Ze’evi” (an attack committed by the PFLP). Bashir al Khairi, former President of the UAWC board of trustees, “was convicted of terrorist offences in 1969 and gaoled for 15 years.” Khairi was the head of the PFLP political bureau. The issue of foreign government funding (via World Vision Australia) to UAWC and its links to the PFLP was highlighted by the Israeli NGO Shurat HaDin, which submitted a report on the matter to the Australian government. Founded in 2009, the Russel Tribunal on Palestine is a kangaroo court that uses a legal façade to create an image of neutrality and credibility, and to accuse Israel of apartheid, war crimes, crimes against humanity, and genocide.